Everyone understands that keeping fit is essential to maintain a healthy lifestyle. While some prefer the gym or team sports, a large number of people enjoy jogging or running. Running is an excellent way to keep fit and stay healthy while enjoying the great outdoors listening to music or an audio book. The majority of runners exercise on hard surfaces such as concrete, tarmac or pavements. This can have an impact on the knees, even when wearing decent running shoes which are designed for road runs. Knees are similar to a shock absorber on a motor vehicle. Like shock absorbers, your knees can wear out or get damaged, if they’re not looked after. The forces put on the knees during a run can sometimes lead to them feeling painful or tender following a exercise. Runners can suffer various types of injury to the knee and medical studies have looked at the effects that running has on the body. A large number of people who play sports and run on a regular basis also experience joint problems later in life and may suffer from arthritis or rheumatism. However, it’s not all doom and gloom for those who love to run. A knee brace may help to protect the knee from absorbing excessive force during a run and prolong the life of the body’s built in shock absorbers. A knee brace is a fairly simple device worn over the knee to give the joint and surrounding area some support while exercising. Knee braces can be made from various materials including neoprene, lycra, foam, metal and plastic. There are various braces on the market and they all offer different types of knee support from general to injury specific. 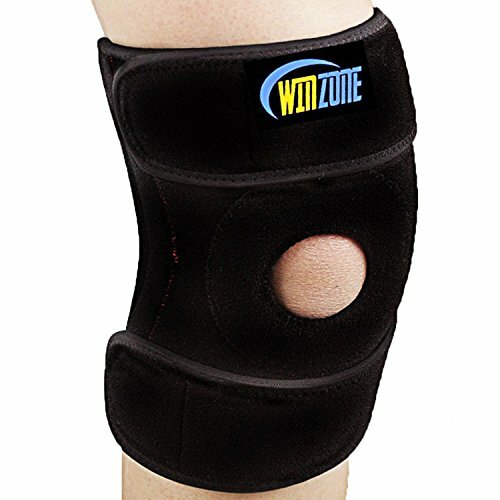 What Is a Knee Brace Used for? Knee braces can be used by runners to help to prevent injury to the knee. Braces are also used to aid recovery after the knee has sustained some type of damage. Many amateur runners will wear a knee brace when they’re pounding the streets. Professional athletes also use them when they’re taking a training session. Using a knee brace doesn’t mean you’ll never experience any problems. Wearing a brace when you’re running can help to minimize the chances of a problem developing now and in later life. Common conditions associated with running include patellofemoral pain syndrome (runner’s knee) and tendon damage. Muscular strains are also a common problem and using a brace can aid blood flow to the muscles as well as giving the knee some protection. Two types of knee brace are used by runners and they both offer different forms of support and compression. Basic knee braces are elasticated sleeves and simply slip over the knee similar to a compression bandage. The majority of these braces are made with neoprene and they provide a warming effect as well as supporting the knee. These basic braces also offer some level of compression which can help to control minor swelling and help with blood flow. Sleeve braces are easy to put on and if they fit well they tend to stay in place during a run. Advanced and elite knee braces offer a little more support than the basic braces. Many of these braces have a doughnut shaped hole which fits over the kneecap allowing it to move forward naturally. There are also braces with flexible side supports or hinges and these can help keep the knee straight by providing a degree of lateral stability. One of the major benefits of these braces is that they can be worn on top of your jogging pants or tracksuit bottoms. There are some important things to look for when you’re choosing a knee brace to use when running. Contrary to popular myth, size does matter, and your brace needs to fit snugly and stay in place. A brace should be secure above and below the knee and not bunch up or crease. You should also use a product that’s comfortable to wear against the skin. When you’re running you’re going to sweat and using a brace that doesn’t retain perspiration is advisable. When excess perspiration clings to the skin for any length of time you can develop a rash and this needs to be avoided. Due to the fact that people come in all shapes and sizes you can’t be certain that a brace is suitable until you use it on a run. A brace that fits one runner may be totally insufficient for you, and you may find that you have to try a number of different braces before you find the perfect product. A knee brace is going to offer some level of support but every runner will have different requirements and you should choose carefully from the products that are available. Don’t use a knee brace to manage the symptoms of an injury sustained whilst running instead of seeking professional medical advice. Your brace needs to be the correct size so that it fits, feels comfortable and stays in place while you’re running. The last thing you need is to have to stop at regular intervals to put your knee brace back into place. Many long distance runners will get into a concentration zone, and a badly fitting brace would be an unwelcome distraction. Ensure you use a knee brace that gives you adequate support without restricting the flow of blood. Cutting off circulation can be extremely dangerous and detrimental to your health. When you’re running your muscles need a good supply of oxygen to prevent cramping and fatigue. If you’re a long distance runner, try using a brace that’s made with breathable fabric and a lining. Using a lined and breathable product will make it feel more comfortable against the skin when it’s worn for long periods of time. Which Is the Best Knee Brace for Running? Having looked at the range of braces available we’ve selected five that offer support for the knee whilst running. The main features we considered for each product were the support provided, comfort and fit, and the price. All of these braces are made from similar materials and can be worn by the majority of short, medium and long distance runners. 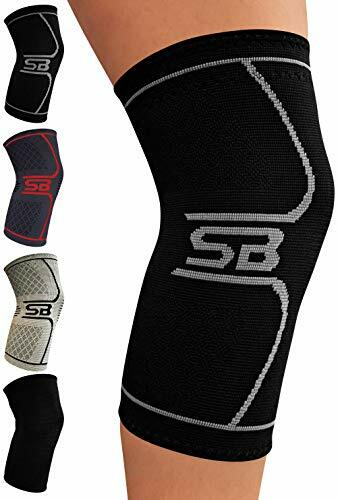 There’s a review for each knee brace along with some advantages and disadvantages of each product. 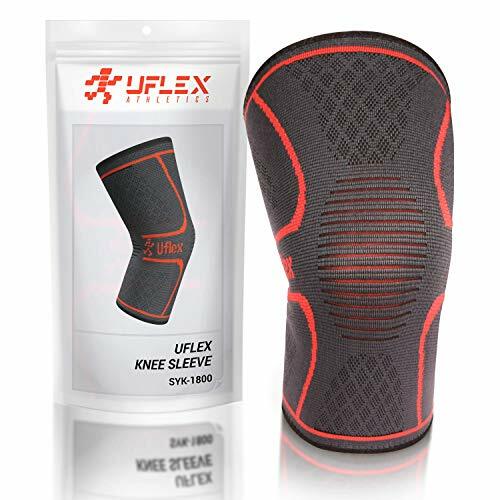 The anti-slip silicone material used to make the UFlex Athletics knee compression sleeve means that it’s comfortable to wear. The sleeve design offers a good level of all round support and it has a slight warming affect which can help to aid muscle recovery. One of the positive features with this brace is that it’s easy to put on, which makes it a great choice for younger runners. The sleeve also has a dual rubber grip at the top end which prevents the brace from slipping down the leg whilst you’re running. The material is breathable and helps runners stay drier during perspiration. Although you can select a small, medium or large sized brace they’re non-adjustable which means they may not fit everyone. Some users have said that the sleeve feels a little tight when it’s worn for the first time. Simple design with no straps to secure. Stays in place due to the efficiency of the rubber grips. Good compression to help with minor swelling and muscular pain. Can be kept in a pocket or purse when not being used. May feel a little tight when new. This hinged knee brace is a good choice for runners who need lateral support as well as some compression. The hinges offer a good level of side support and they can be removed if they’re not required. The breathable neoprene fabric and open patella design make this brace an ideal choice for long distance runs. The way this brace is secured with Velcro straps ensures that it stays in place for the duration of a run. The fabric used and the design may also help to reduce the amount of perspiration retained against the skin. 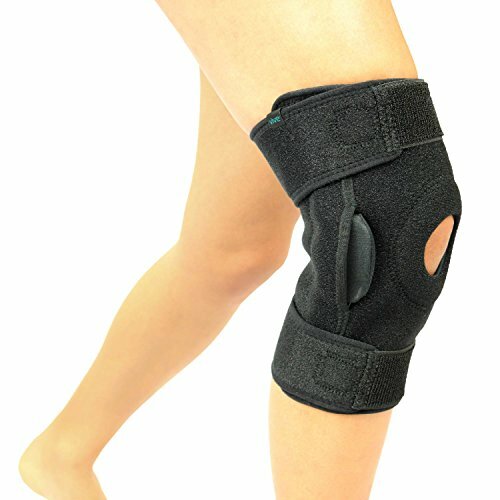 Some users have commented that this brace can feel bulky and uncomfortable behind the knee due to the fabric thickness. The hinges may also dig into the skin during the course of a run which some runners have found to be uncomfortable. Extra strong top and bottom securing straps. Removable hinges for flexible levels of support. Breathable fabric reduces the chances of sweat rash. The SB SOX brace is a good choice for everyday wear due to its lightweight material and ease of use. The compression design gives a good level of support for the knee and it may also help to encourage blood flow to the muscles. The elasticity can also help to contain any slight swelling around the knee. A great feature on this brace are the non-slip cuffs at the top and bottom that prevent it from moving around during a run. The brace can easily be hand washed which makes it an ideal choice if you need to use it daily. Some users have commented that the brace can feel a little tight at the top end due to the cuff. Customers have also said that the size of the brace is not consistent with others on the market making it difficult to obtain a suitable fit. Slightly tight around the thigh. Thin fabric can wear quickly. This Winzone knee brace offers all round support due to its side stabilizers. The brace gives adequate support behind the knee, and to the sides, and allows natural movement due to an open patella design. Another good feature is that this brace is fully adjustable. This product will fit the majority of runners and stays in place to give a snug fit. Soft fabric makes the brace comfortable to wear and the Velcro straps make the product easy to put on and take off. The length of the straps enables the brace to be worn against the skin or over clothing. Some customers have noted that over a period of time the Velcro doesn’t hold as well as it should. The length of the brace also means that it can be tricky to securely fasten the straps for tall people. Side stabilizers for extra lateral support. Soft material that feels comfortable against the skin. Can be worn over clothing which is useful if you’re going to be running in colder climates. Doesn’t move around when fixed properly. Short length may not suit taller runners. Velcro can wear over a period of time leading to the brace moving around. 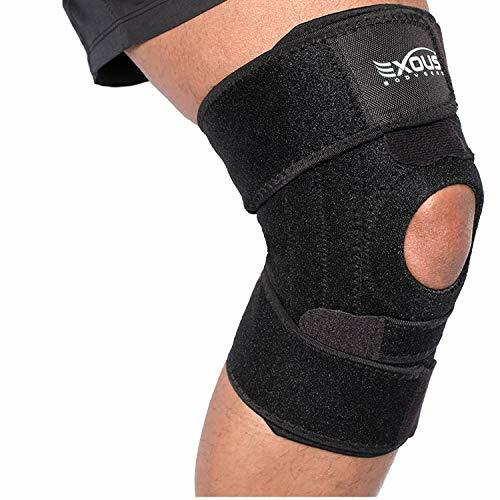 This brace by Exous offers all round support for the knee as well as providing some compresion. Lateral support is administered by the flexible pieces on either side of the knee, and the open patella design allows the kneecap to move naturally whilst keeping muscles and tendons in place. The four point Velcro fixing keeps the brace in place to provide a snug fit around the thigh, upper calf and patella. The brace is lined with lycra to make it more comfortable against the skin which can help to minimize sweating. A few runners commented that this brace sometimes bunches up behind the knee making it a little uncomfortable. Others said that the material tends to lose its elasticity over a period of time which may reduce the effectiveness of the compression. Adjustable straps allow for a comfortable fit. Four straps to give more fixing options. Velcro fastenings make the brace easy to put on and take off. Thick material can bunch up behind the knee which may be uncomfortable. Not a suitable product for children or teenagers—the straps are quite long and when wrapped around a smaller leg will feel uncomfortable. All of the braces we reviewed offer a good level of knee support and some of them also provide compression. None of the products were overly expensive and they’re all well constructed meaning they should last. Having looked at construction, comfort, effectiveness and price the best knee brace for running is the UFlex Athletics Knee Compression Sleeve. This reasonably priced product ticks all of the boxes and users have said that it’s easy to use and comfortable. The brace provides the support that runners are looking for and it’s affordable. The fact that it stays in place on even the longest runs makes it the stand out product. Being able to fold it up and slip it into your purse or pocket is also useful. This is an all round knee brace that can be used on both short and long distance runs by people of all ages. Although it’s a sleeve design, it doesn’t seem to retain perspiration, due to the fabric used to make it. People who used this brace have also said that it performed much better than some of the higher priced knee braces that are available.